La Boetie Gallery Inc., New York. J. Kallir, Egon Schiele, The Complete Works, New York 1990, no. 1678, p. 544 (illustrated). New York, La Boetie Gallery, Selection of Major 20th Century Paintings, Sculptures and Drawings, 1969, no. 83 (illustrated). New York, La Boetie Gallery, Egon Schiele and His Circle, May-June 1971, no. 26 (illustrated). 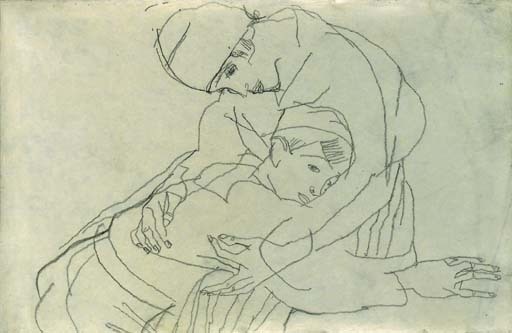 According to Jane Kallir, the sitters for this drawing are probably Edith Harms and her nephew, Paul Erdmann.